“Engage people with what they expect; it is what they are able to discern that confirms their projections. It settles them into predictable patterns of response, occupying their minds while you wait for the extraordinary moment — that which they cannot anticipate.” Sun Tzu. I noticed some Hornbills up in a Lead Wood (Combretum Imberbi), they were Pale Billed Hornbills another first for the season to add on to our list. We arrived at Lake Manze at around 9:45 and I stopped for Breakfast under my favourite Baobab and we were joined by an old giraffe bull who quietly browsed around us with our last cup of coffee. We didn’t drive 400meters and came through a small Doum Palm thicket and there on display one of the three musketeers and a lioness. We barely turned off the engine and he was up paying very specific interest to the lioness, they mated right there, WOW. No matter how many times we are privileged to see this vocalising and facial expression are always mind blowing. After the 15seconds of romance he lay down next to her I decided to stay for a while until they mated again which they did like clockwork. Rather pleased with the outcome we slowly turned the heading for camp until we spotted two lionesses looking long and hard at a congregation of some 200 Wildebeest. One lioness started trotting directly at the herd, she is too far I said to run them down from that distance as lions can only maintain their top speed of 90km/h or 22meters a second for about 60meters or so. But where is the second lioness???? She ran down a creek without notice and spooked a second group of Wildebeest directly towards her sister. BANG!! the catch, if you blinked you would have missed it. It is difficult to explain the process of trying to take a picture, keeping up with the lions, interpreting for your guests, remembering the clutch and where the correct gear is located, getting in the correct position for photos, all at once. Africa’s three big cats – lion, leopard and cheetah – all capture and kill their prey in much the same manner as a domestic cat kills a mouse. The relative body dimensions, dentition and claws of all cats are basically the same. 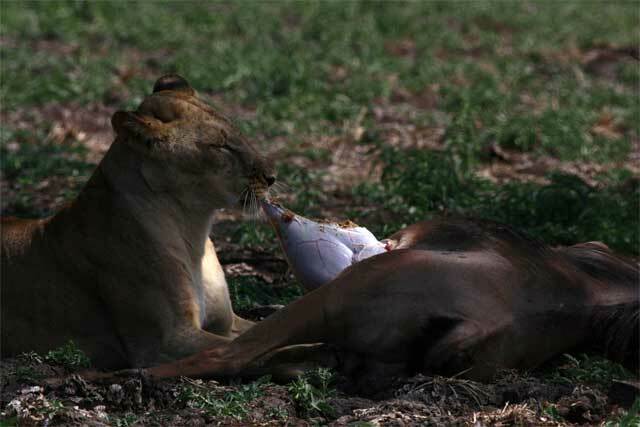 Body size, social habits and habitat preferences are what divide the members of Felidae family. 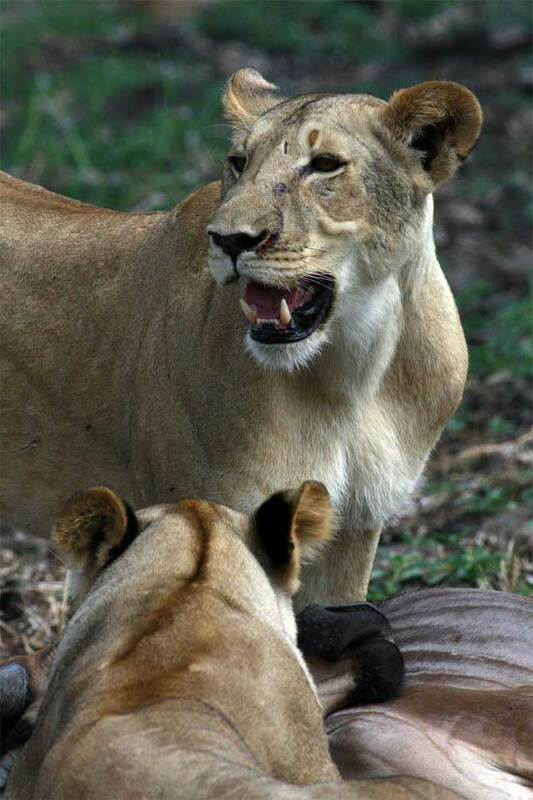 Lion are the only truly social felines and adult females typically hunt in pairs or groups. When hunting favoured prey such as Wildebeest or Zebra, lions usually stalk to within 50 metres before rushing at them. 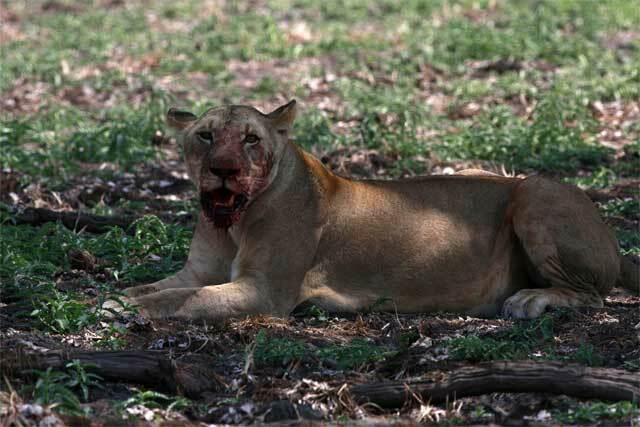 In most cases the lions will wait until the quarry has turned away or has its head down. Once it detects danger, the prey darts but it may be too late. On rare occasions, (and invariably in daylight) as yesterday lion may ambush prey, with one member of the pride lying in wait as its partner forces the quarry to run in its direction. 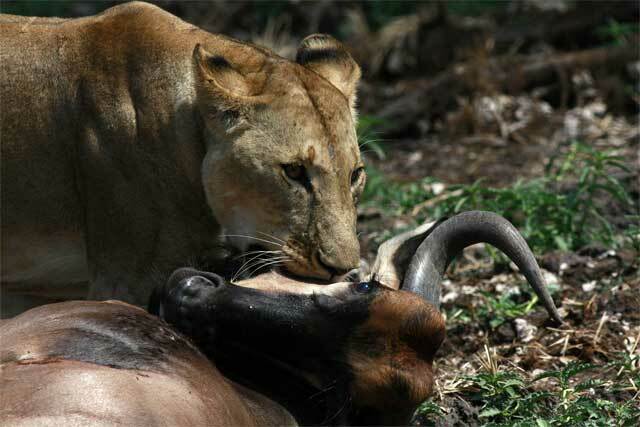 The sheer abundance of prey can also determine hunting strategies. When congregated herds of wildebeest are milling about Lake Manze lions can simply rush into them and pull down one or more of the confused animals. When herds gather to cross the Grumeti or Mara rivers, lions simply wait at favoured crossing points and pick off the startled wildebeest. 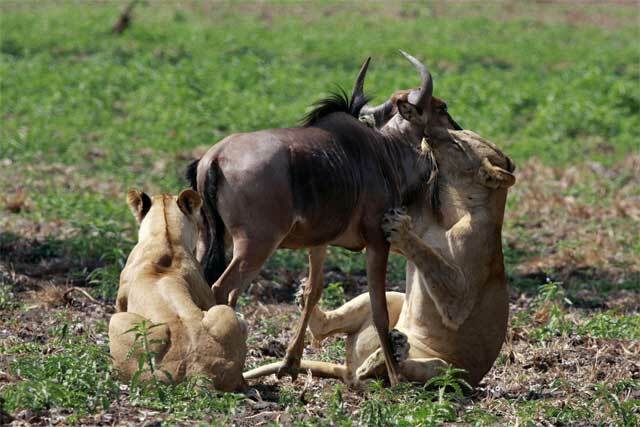 Although male lions have the reputation to pry free meals from hardworking lionesses, they are called upon when extra large prey like Giraffe and Buffalo is tackled. Several females may corner and threaten a buffalo, but it will usually take a big male to topple such a beast. 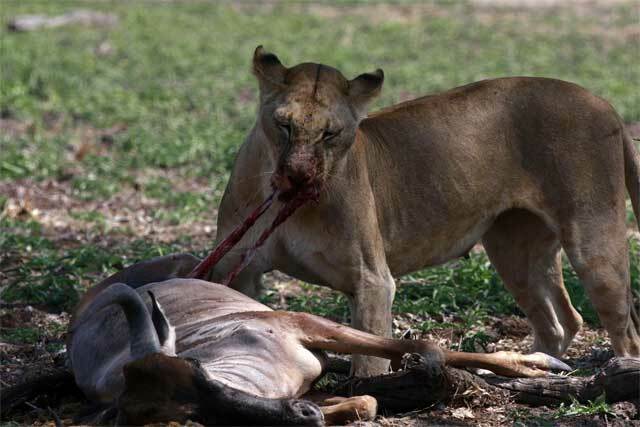 In northern Botswana, some large lion prides have taken to preying on young and even sub-adult elephant, and this entails tight teamwork to separate their targets from defensive adults. In South Africa’s Kruger National Park, lions appear to have become adept at killing giraffe by attacking them on tarmac roads where the tall mammals lose their foothold on the slippery surface. 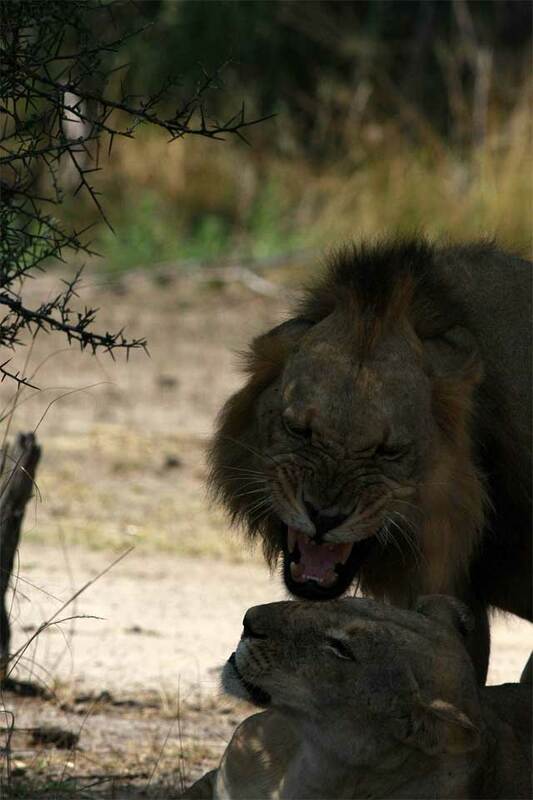 Lions generally have a higher success rate when hunting after dark. We arrived back at camp awestricken by the mornings events and could not believe how fortunate we where. A special thanks and mention to Rika and Karen for patiently waiting for us to return (1 Hour late) for lunch. 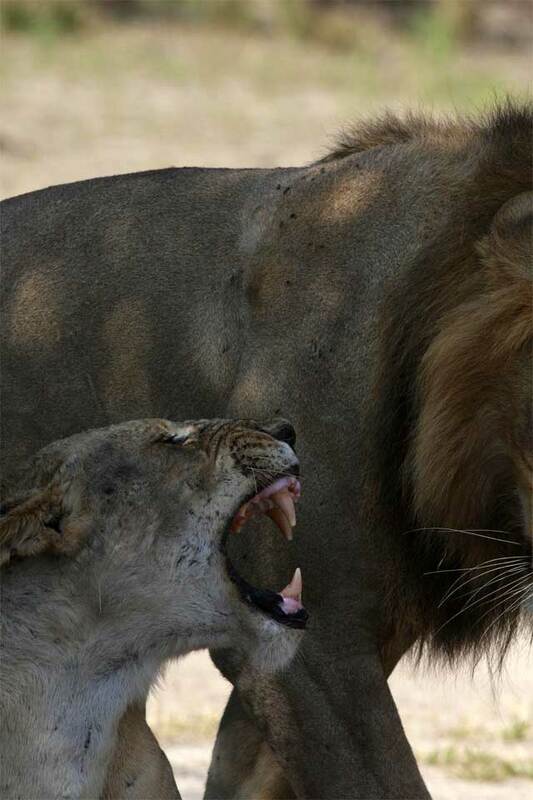 This entry was posted in Werner, Wildlife and tagged Beho Beho, camp, lions, safari, selous, Werner. Bookmark the permalink.